Founders – Quest Hunt Co.
Three avid outdoorsman on a mission to provide a greater experience to all those just like us. Long before thousands of America’s hunters set out on their Quest to top our hunting tournament leaderboards, the word Quest meant something different to its founders. Our Quest was to make a living doing exactly what we loved in the industry that we are all so passionate about; hunting and the outdoors. Three avid outdoorsmen on a mission to provide a greater experience to all those just like us. Men and women that loved to hunt but had little to no opportunities to get involved and compete in a community of hunters. The question was simple. What if there was a large community of hunters that had the opportunity to hunt where they wanted, didn’t cost a fortune, and opened up huge opportunities in winnings and notoriety in the market? We couldn’t be more excited to tell you that now there is. Every single Quest Hunt Co hunter has all of those opportunities and more. Our goal has always been to offer a first class hunting experience to every person with a low cost, high stakes payout. 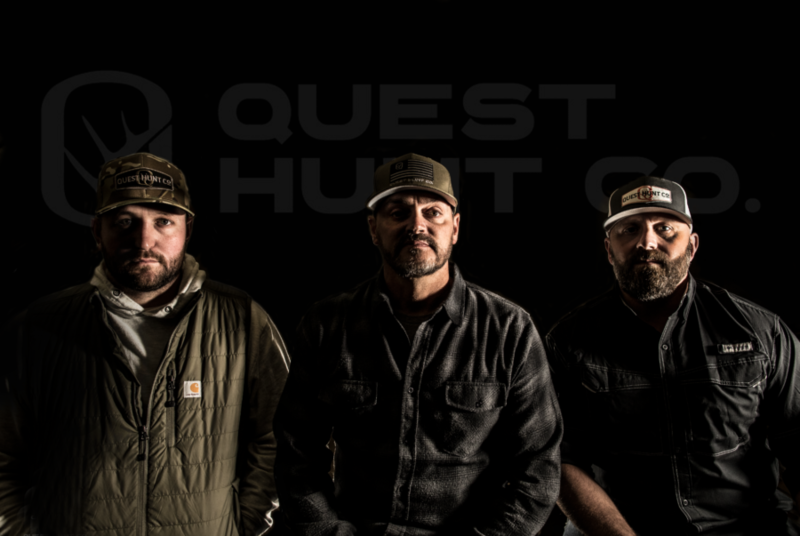 Quest Hunt Co has evolved from an enthusiastic idea over dinner at a local steakhouse to a recognizable brand in the industry. We can’t thank you enough for taking some time to learn more about our company, and look forward to seeing you on our leaderboards. Remember… It’s Anyone’s Game. Signup for notifications about tournament details. We may hunt for different reasons, but we each have our quest. As hunters, we share one thing—a love for the story. Texts to a buddy, swapped photos at the barber, or showing off that deer in the back of your pickup at the gas station… What makes hunting great is sharing the experience. We want to make that community even stronger. Copyright 2018, Quest Hunting Co.
©2019 Hook Creative | ©Quest Hunt Co.